An innovative housing complex in the Second District will soon take on the challenge of providing a supportive home to some of society’s most vulnerable, including youths aging out of foster care, the mentally ill and formerly homeless. 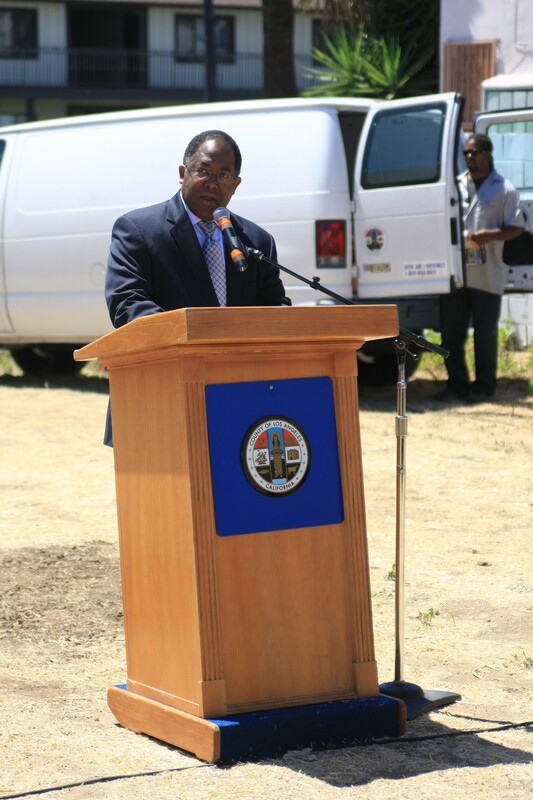 Supervisor Mark Ridley-Thomas joined the Koreatown Youth and Community Center and the Little Tokyo Service Center on June 29 to break ground for the Menlo Family Housing project on Menlo Avenue, near the intersection of Pico Boulevard and Vermont Avenue. The 60-unit apartment complex will serve low-income residents, those with mental illnesses, transition aged foster youths and homeless families. On-site services will include case management, counseling, after-school programs and family literacy classes. 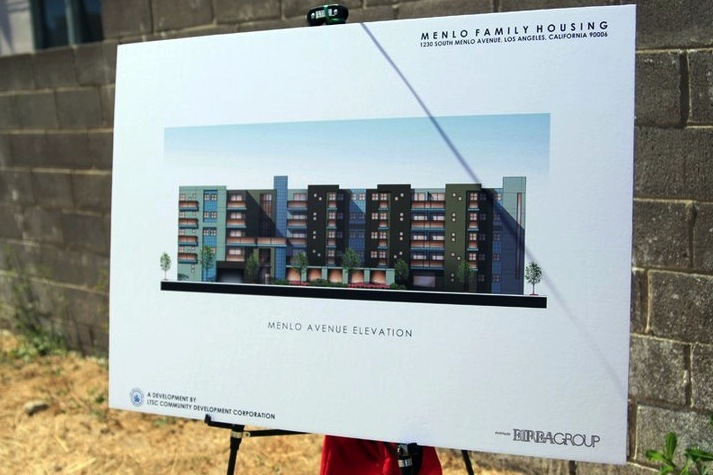 Supervisor Ridley-Thomas noted the project is special for its combination of social services and affordable housing in a single location, which he identified early in his term as a top priority. The project, located in one of the hotspots of the 1992 civil unrest, also represents an inspired collaboration among organizations and elected officials with diverse constituencies. “This project shows what happens when inspiration, cooperation and determination come together,” Ridley-Thomas said. “Shortly after I was elected in 2008, I convened a transition team of knowledgeable community leaders. Among their key recommendations to me was to pursue novel approaches to combine the overlapping challenges of mental health care, transition-age youths and homelessness. This project makes that vision a reality,” Ridley-Thomas said. 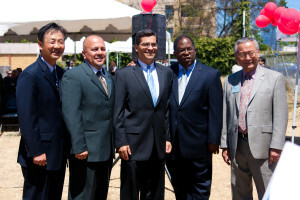 Along with Supervisor Ridley-Thomas, Congressman Xavier Becerra and Los Angeles City Councilman Ed Reyes were present to celebrate the start of construction. Also present were Los Angeles County Department of Mental Health Director Marvin Southard and Sean Rogan, executive director of the County Community Development Commission/Housing Authority. A ten week endangered Arts Internship Program that has given more than 1,400 undergraduate college students the opportunity to work with a non profit organization has been restored through the action taken by the Board of Supervisors at the County Budget meeting. 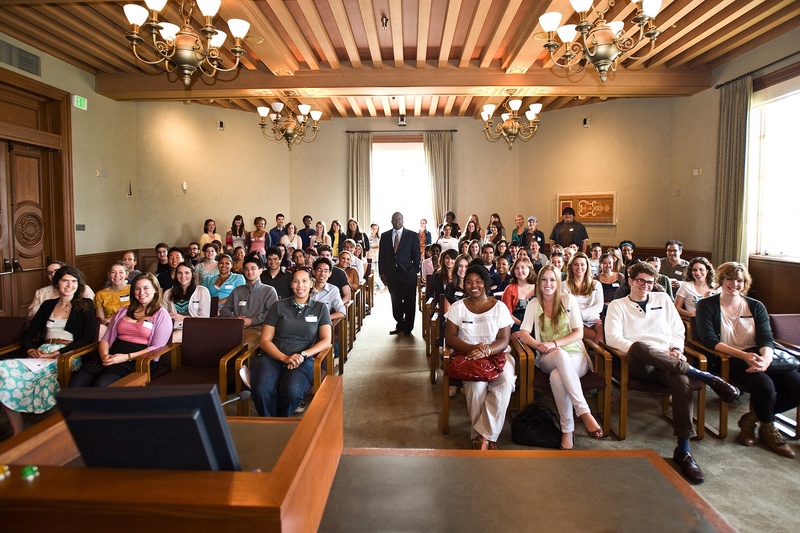 Supervisor Mark Ridley-Thomas spoke to the 75 undergraduate student who received paid summer internships in the arts at the 2011 Arts Summit at City Hall in Pasadena. Since the expiration of federal stimulus funds in 2010, the Arts Internship Program has been in jeopardy of being eliminated from the County budget. Supervisor Ridley-Thomas has championed the effort to restore funds for the program. Last year the Board of Supervisors voted in favor of the Ridley-Thomas motion which financially supported the arts program for one additional year. The action by the Board of Supervisors today assures that the arts internship program will automatically be considered as part of the county budget each year. The Arts Internship Program was created in 1999, by the Los Angeles County Board of Supervisors to provide internships for nonprofit performing and literary arts organizations. Undergraduate students receive on the job training and experience working in nonprofit organizations. As part of the program students are paid to serve as staff members, board members and volunteers in non profit arts organizations. Students take on leadership roles and develop business skills in order to work on seasonal and special projects in various non profit organizations. Plan Ahead, Avoid The Area, Or Stay Home. That’s the message public safety officials are sending to the public in anticipation of a planned 10-mile, 53-hour closure of the I-405 freeway between the U.S. 101 and I-10 on the weekend of July 16-17, 2011 for planned demolition work on the Mulholland Bridge, part of a major I-405 improvement project. The Los Angeles Police Department, Los Angeles Fire Department, California Highway Patrol, Los Angeles Department of Transportation, Metro and Caltrans are informing the public in advance that if they do not have a critical need to be in or near the vicinity of the closure, they are being asked to avoid the area. The Los Angeles County Metropolitan Transportation Authority (Metro) has produced a new I-405 closure Public Service Announcement featuring actor Erik Estrada that is available for public use. Available in English and Spanish, the video PSA reminds the public to Plan Ahead, Avoid the Area or Stay Home during the closure weekend July 16-17, 2011. Estrada, who played “Poncherello, a California Highway Patrol officer in the popular 1970s-1980s TV show CHiP’s, volunteered to do the PSA to Metro for free in recognition of the importance this freeway improvement project will have in adding carpool lane capacity to the I-405 between the I-10 and U.S. 101 freeways. Motorists who must travel through the Los Angeles metropolitan area are advised to use alternate freeways within the region, including the 5, 15, 23, 55, 57, 101, 118, 126, 210, 605 and 710 freeways to bypass the impacted area. In addition, public transportation options are available such as the Metro Rail service within L.A. County and Metrolink servicing the five county Southern California region. Additional alternate route information will be made available on the project web site at www.metro.net/405. Sepulveda Boulevard is intended as an alternate route for local resident access only. Sepulveda Boulevard will not have the capacity to accommodate both local and diverted freeway traffic. Those using Sepulveda Boulevard should expect extreme congestion and lengthy delays. Motorists should instead use alternate regional freeway routes to completely bypass the Sepulveda Pass. Mark Ridley-Thomas is a foremost advocate of neighborhood participation in government decision-making. Lucky for us his neighborhood includes USC. 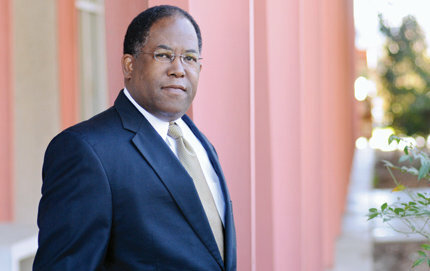 Mark Ridley-Thomas (Ph.D., religion, '89) is a Los Angeles County Supervisor, 2nd District. Photo by Carlos Puma. In 1968, Mark Ridley-Thomas was a seventh grader at George Washington Carver Middle School in southeast Los Angeles. At Victory Baptist Church near his school campus, the Rev. Dr. Martin Luther King Jr. often preached and organized. When asked if he remembers April 4, 1968, the Los Angeles County supervisor is visibly astonished, rightfully so, that such a question could be pondered. 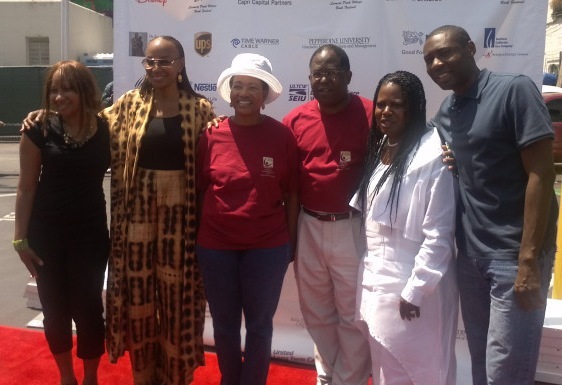 Supervisor Ridley-Thomas spoke to thousands of book lovers, families, authors, and fans of all ages gathered in Leimert Park on Saturday, June 25, 2011 for the Fifth Annual Leimert Park Village Book Fair. This year’s fair featured 150 celebrity readings, book signings, writing workshops, panel discussions, poetry readings, stage performances, and musical acts. Leimert Park Village Book Fair has hosted some of the national’s top authors and artists including Nikki Govanni, Ishmael Reed, Pulizer Prize Winner Douglass A. Blackmon, California Poet Laureate Emeritus Al Young, Antwone Fisher, Hill Harper, and Synthia Saint James, just to name a few. LPVBF also annually distributes more than 1,500 free books to fair attendees, including over 300 books to local foster care children. This year featured former editor-in-chief of Essence magazine Susan L. Taylor, economist Dr. Julianne Malveaux, and Pulitzer Prize-winning journalist-turned-author Isabel Wilkerson. Among the notable authors present was Sugar Ray Leonard promoting his recently published autobiography. The Leimert Park Village Book Fair was founded in 2006 by Cynthia Ethusian Exum with the goal of promoting literacy and education in Los Angeles. The Leimert Park Village Book Fair was inspired by a project in February 1999 when Ms. Exum partnered with Our Authors Study Club, Inc. to present a ‘Festival of African American Authors’ at Los Angeles Southwest College. Its success in drawing 10 authors participating for an audience of 40 inspired the idea of creating an annual literary event. The concept of establishing a book fair in the community was further encouraged when Ms. Exum partnered with organizations Helping One Another Progress, Inc., Eso Won Books, the Leimert Park Merchant’s Association, and the 8th District Task Force Committee, and the office of Los Angeles Councilmember Bernard C. Parks, 8th District. Leimert Park was chosen as the host venue site because of its importance as the cultural/artistic center of the African American Community in Los Angeles. The Inaugural Leimert Park Book was organized by a Planning Committee of over 30 persons including representatives from local schools, corporate/businesses, libraries, literary non-profit organizations, community organizations, and local authors, poets, and spoken word performers. Today, the Annual Leimert Park Village Book fair attracts over 200 authors, poets, spoken word artists, storytellers, performers, and literary/educational exhibitor participants – and boasts an audience of over 5,000. Since its inception the Leimert Park Village book fair has grown in popularity and prestige becoming a cultural tradition and premier summer literary event. This year’s Book Fair will take place on Saturday, June 25, 2011, and everyone is invited this day of celebrating the written word.